I went a little overboard with the sweets this week so I figured it was time to share an easy to make savory dish. 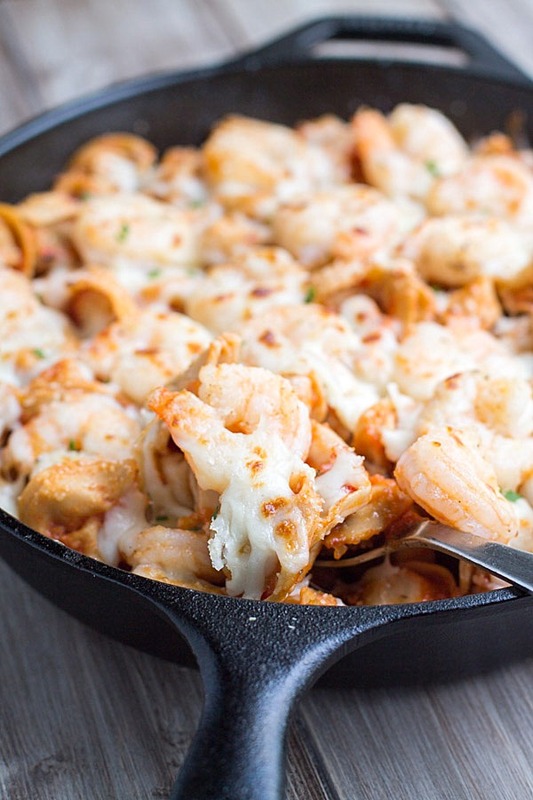 This Italian Shrimp Tortellini Bake is equally as easy to make as this Twenty Minute Easy Tortellini Bake and this Skillet Pizza Pasta Bake. It’s on the table in 30 minutes so there’s no reason to spend hours in the kitchen after a long day at work. True story – I didn’t think I was going to be able to share this recipe with you today. I couldn’t find the notebook that I jotted it down in. I may have been panicking just a little because I knew there were other recipes in that notebook that I hadn’t shared yet. Luckily, after running around my house like a crazy person, I found it. I really need to get my blog things a little better organized. On the outside, it looks organized. But when you dig into everything, it’s a total mess. I call it organized chaos. That’s so cliche, isn’t it? When I make an easy pasta dish, a few simple ingredients go into it. Pasta, cheese, sauce and sometimes meat. I like to sprinkle the top of my pasta dishes with fresh herbs such as basil, oregano or parsley. They make the dish much more pleasing to the eye. And if I use strong herbs, such as oregano or basil, they make the dish much more pleasing to the palate. I used my own sauce in this recipe. I made this easy to make Slow Cooker Spaghetti Sauce. I made a few changes that you may want to take note of. I used a 28oz can of plum tomatoes in place of the crushed tomatoes and skipped the tomato paste. These changes produced a marinara type sauce. It was crazy good. I think I may prefer it to my original recipe. Using my sauce recipe? If you prefer thick sauces, use the original recipe. If you prefer marinara sauces, use my original recipe using the changes I noted. If you don’t want to make the sauce, feel free to use your favorite store bought sauce. If you’re a cheese fanatic like me, then you’ll want to load up on Mozzarella and parmesan cheeses. If you’re trying to cut back on calories or cheese, reduce the amounts to suit your preference. Enjoy the recipe. This looks absolutely amazing Julie! I love adding shrimp into my pasta! Organized chaos sounds awfully familiar to me! 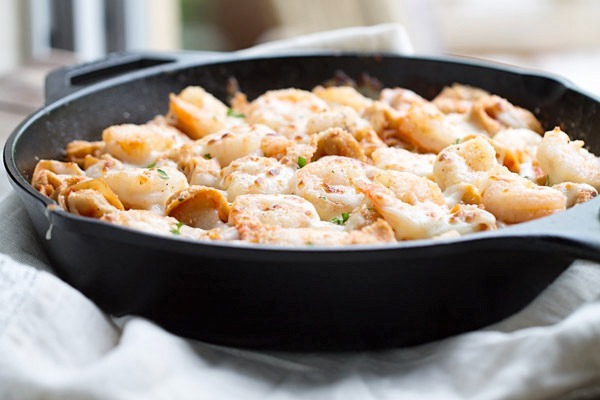 Good for you for actually finding it … I often don’t :) I’m so glad you did because shrimp is a popular seafood dish at our house! Even if it wasn’t, cheese tortellini is uh-mazing. Thank you to whoever invented it. 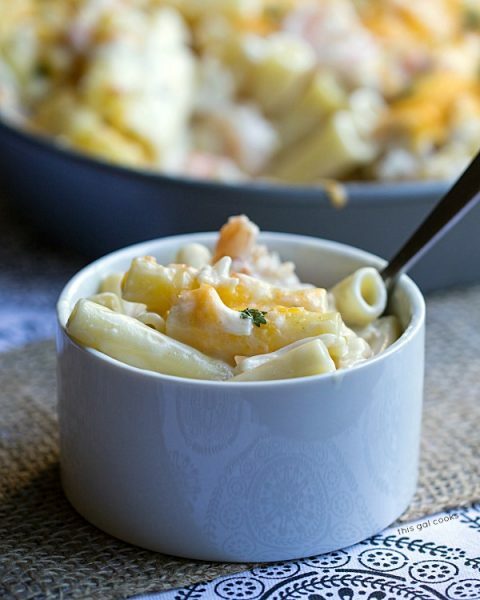 Love this recipe Julie! You nailed easy and gorgeous! YES! A huge thank you to whoever invented cheese tortellini. It’s amazing! Thanks for stopping by, Mary Frances! Yummy! I like how simple you made this recipe. This will be good for a busy day. Thanks Julie! This looks so good. I can’t wait to try it. You are not the only one who is slacking in the organization department. The fact that you are even organized enough to use a notebook is a good thing. I always write recipes down on random pieces of paper that are lying around when I can’t find a notebook. Oh Julie, I am the queen of organised chaos! But it seems to work … most of the time! I’ve done the almost losing my notes thing a couple of times, but the worst is not remembering whether I’ve already uploaded my photos … AFTER deleting them from my camera. Yikes! Anyway, gorgeous little easy meal here. I love that you’ve used tortellini. OMG. I totally know the feeling with the camera and photos. In fact, I’ve almost had a panic attack over not seeing the images on my flash card or on my computer. Turns out that I saved them to a folder I don’t normally save them to! 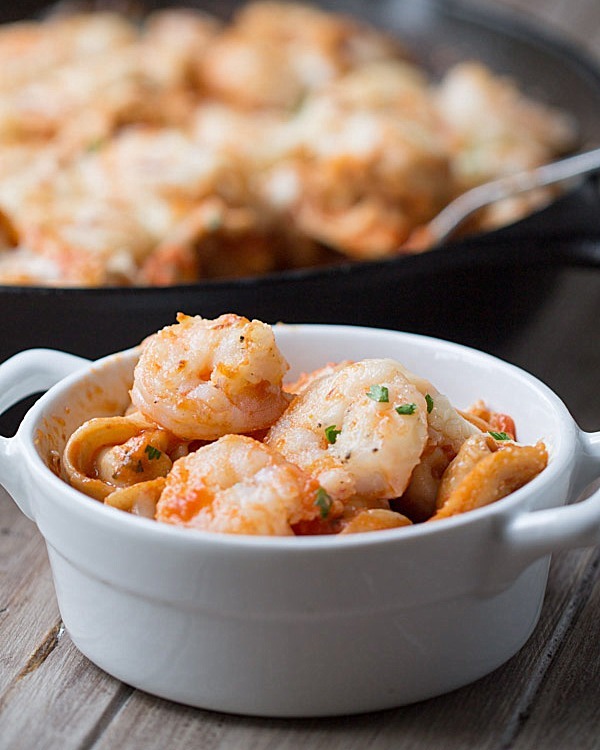 The shrimp and tortellini look great! It doesn’t get better than this Julie! 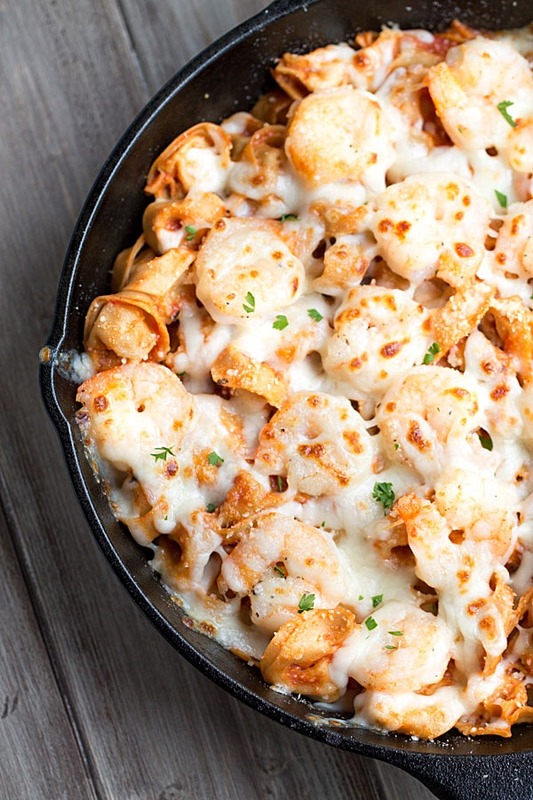 I always need an easy and quick dinner for the family and since we all love pasta, this will be added to the line up! I’m always losing my recipe notes and stuff – I’m the most unorganished human being ever hahaha. Super easy. Super good. This is a keeper. I pinned it. 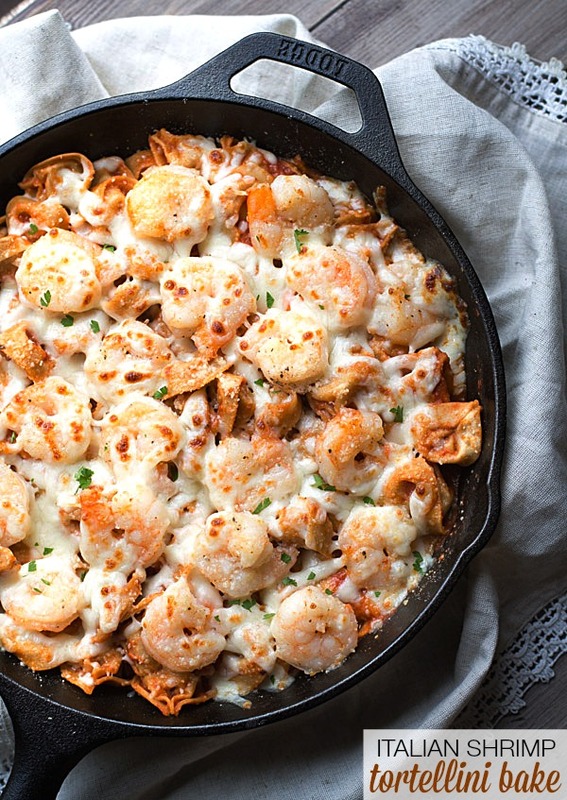 I love your tortellini bakes and this italian shrimp sounds incredible! I’ve been known to lose a few recipes and then have to recreate them all over again. Glad you were able to share this one with us! I need to start getting more organized too so I’m so glad you found the recipe and are sharing it with us :) Love quick and easy dishes like this – it looks incredible! 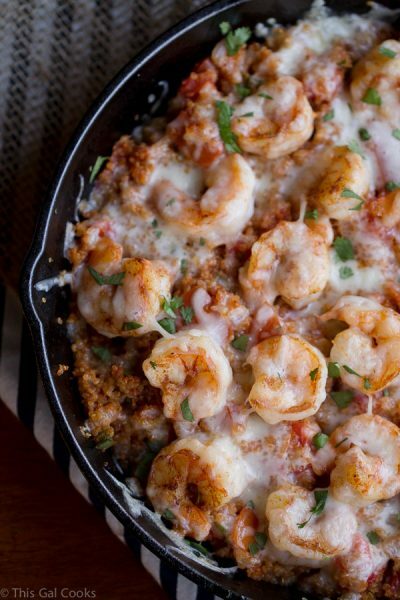 Love this dish Julie – it looks like it belongs on my menu soon… I’m always looking for new ways to use shrimp! Pinned! This looks absolutely delicious! Congratulation! I made this tonight! Was amazing! used jarred sauce (was to hungry to make some sauce). thank you for sharing! Hi Eileen! You’re welcome. So glad you enjoyed the recipe. Thanks for stopping by to let me know! Glad you enjoyed the recipe, Maude! I was wondering would it ruin the meal if i also added italian sausage and shrimp and did it with white sauce ? It wouldn’t ruin the recipe but it would be a completely different meal as far as flavor goes. Just made this for dinner tonight. Super easy to make. Delicious!!! I will be making this again!! 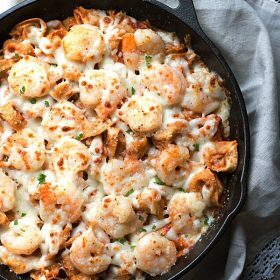 Yummy recipe, I made this for dinner and needless to say it was a hit! Thank you Mimi! It is hard to cut back on cheese! 😁😁😁❤️! This recipe made me feel like I was a chef at a restaurant. I really enjoyed it. It’s quick and simple, but very flavorful.